1) Two pads were incinerated in someone's backyard: one was Always and one was organic cotton. The Always pad burned differently and released a lot of "toxins". 2) Two tampons were submerged in ultra-purified water on someone's kitchen table: one was O.B and one was organic cotton. The O.B tampon supposedly released a lot more fibers, which are assumed to be rayon, and the O.B tampon also developed spots, which are assumed to be mold. Based on these experiments, there's a petition to Procter & Gamble to disclose the make up of their fem care products. The concern is that the contents of the fem care products will leach into our systems, since "our skin is the largest and most absorbent organ in our body" (that's from Dr Mercola's site, highlighting the dangers of inorganic fem care products). I checked Snopes.com for any information on tampons and pads. There are two false urban legends regarding tampons being associated with toxic shock syndrome, as well as the presence of asbestos in tampons. There is also a false urban legend regarding the use of sanitary pads being linked to cases of uterine and bladder cancer. I went to pubmed and typed in "feminine hygiene products". I found 1337 hits. That's not a typo. 1337 various studies have been carried out examining different aspects of feminine hygiene products ranging from their use in HPV detection, HIV prevention, and health education. Study methods range from the examination for irritation with new film surfaces to the analysis of changes in bacterial cultures with feminine care products. I checked the American Cancer Society's webpage, which stated that the link between tampons and cancer is "absurd". I searched on the American Medical Association's webpage, and couldn't find anything. With 1337 studies performed, the alleged toxicity of fem care products is not an issue to our doctors or to the FDA. Instead of speculating that it's due to payoffs from big corporations like P&G or Unilever, I will propose that it's because it's not a problem. There are several issues at hand. One is that the team or individual behind this whole movement has not done their homework. If I was able to find this information during my lunch break at work, then so could they. This is perhaps best highlighted by the fact that O.B tampons are not made by P&G and that their petition on change.org is to the incorrect person. As to the burning of the products, I hate to say it but that experiment is up there with putting salt water fish in fresh water to see if they'll die. Always products contain glue, plastic liners, and other oil-based compounds which anyone would expect to burn differently from an organic cotton pad. As for the mold, if you look at the pictures those brown specs are present even at 2 hours. But even at 24 hours, the likelihood that it's mold is pretty low, and it's probably just cotton fibers. The natural baby care products may contain ingredients from GM crops. There is no evidence that any of this is true. In the past, I've shown how we might create a sharknado or a zombie apocalypse, in similar hypothetical statements. At this point, we're beyond sharknados. We're at sharktopi (is that the plural of a sharktopus?). My next point is regarding your "right to know". I am willing to bet Baby-Boy's two chubby cheeks that in the highly unlikely scenario that P&G responds to your request, the list of ingredients in their feminine care products will include compounds with words like "poly-X" or "ethyl-Y" or "nitro-Z" and you will be displeased because they won't sound "natural". Someone out there will do a bit of research and will probably discover that those compounds are also present in other ominous things like trash bags or the sole of your shoes, and you will panic. So instead of making a ruckus and trying to get a giant corporation to disclose trade secrets which they are not legally obliged to provide, why don't you just buy organic fem care products and be done with it? Finally, the video with the fem care product bonfire was put together by a company that sells "100% natural fem care products". So isn't there a possibility that you're being duped by a company that's trying to sell their product into believing that there's an issue when there really isn't one? I'd like to close with a personal note. My sister, the mother of two phenomenal kids, is a chemical engineer and has been working for P&G for over 5 years. She started as an intern and has worked with them in two different countries, so I've met a few of her friends and colleagues. And she worked in their fem care product lines. I've always felt that the mark of a good product is brand loyalty, especially from its own employees. And I have never seen a company with employees as loyal to their products as P&G, with the possible exceptions of Google and Apple. So if you think that they put products out there without proper testing, you're wrong. If you think they'd create products that would knowingly endanger you, you're outta whack. I've said this before and I'll say it again: yes, big corporations (correction: ALL corporations including companies that make "100% natural tampons") are in the business of making money and to create a crummy product or a product that would be recalled would not be conducive to their goals. This post is going to look into the topic of Round-Up. You may have seen bottles of Round-Up at Home Depot and other retail stores. It's a weed and grass killer that many people use to get rid of weeds/grass on driveways, pathways or flower beds. The active ingredient in the herbicide is glyphosate. So how does glyphosate kill weeds and other plants (source is here)? It basically interferes with a biochemical pathway which plants need in order to make 3 crucial amino acids (in case you were curious, the name of the pathway is the shikimate pathway). It messes up one of the enzymes needed in the pathway, the amino acids never get made, and the plant dies. The enzyme that gets inhibited by glyphosate is called 5-enolpyruvylshikimate-3-phosphate synthase, but it's been wisely abbreviated as EPSP (phew!). I could only find evidence that this enzyme exists in plants, fungi, and microbes. So it does not seem to be present in animals. There is a bacteria whose EPSP enzyme is not affected by glyphosate. The EPSP synthase gene from that bacteria has been inserted into specific crops, thereby creating glyphosate resistant crops. As a consequence, growers can spray their fields with glyphosate/Round-Up. Most plants/weeds will die because the EPSP synthase enzyme will be inhibited. But the transgenic crop will continue to grow because it has the bacterial version of EPSP synthase, whose activity is unaffected by glyphosate. 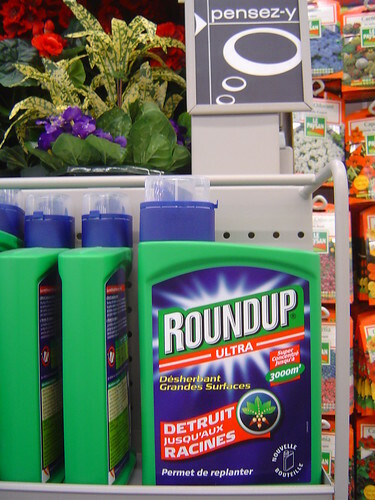 Round-up Resistant crops have been growing long enough that Monsanto's patent on Round-up has expired (note that the patent on the GMO seeds has not expired, so I think that growers who use Monsanto Round-up Resistant crops have to use Monsanto's Round-up). (I've been corrected on that last comment. Growers who use Monsanto seeds to not have to use Monsanto's Round-Up). This week I received requests from two people to review papers that look at glyphosate causing cell death. The most recent paper published on the topic came out last month in the International Journal of Toxicology (as a side-note, it took me forever to get a copy of this paper. We scientists should be more vocal in our demands for open-access journals). Due to this paper, there has been a flurry of articles/blogs highlighting the dangers of GMOs. So what did they do in the paper? Basically, they took liver cell lines and grew them under different conditions. As treatments, they used diluted Round-Up, as well as several components of Round-Up. Then they examined cell death both directly, as well as biochemically (they looked for the presence/absence of proteins associated with cell death). To summarize their results, the cells treated with Round-Up died. Similar studies had been performed by other groups. A study published in 2009 (which I do not have access to and could only read the abstract) reported similar findings. What was unique about the more recent paper is that they used less Round-Up for their study. I bet you're wondering if I will stop feeding my family Round-Up Resistant GMOs over this. There are several thoughts going through my head over this. 1) How much glyphosate are you really eating? When I first read these papers, my gut reaction was "hmmm... I should do a better job washing my fruits and veggies". But then it hit me: none of my fruits and veggies are glyphosate-resistant GMOs. Round-Up Ready seeds are cash crops: canola, corn, cotton, etc. Our bananas, apples, delicious peaches, and succulent pomegranates are not GMOs (although I've previously argued for a GMO pomegranate... I'd buy that sucker in a heartbeat). By the time any components from glyphosate-resistant GMOs enter my food, they've been washed, stripped, boiled, pressed and reduced to a compound. So how much glyphosate is actually there? I tried to do a web search to find out how much glyphosate is in processed food, and I had a tough time with that search. Thanks to twitter, it was suggested that I review a report put together by the USDA's Agricultural Marketing Service (thank you @geneticmaize!). This annual report examines the amount of pesticide in our food and water, including items such as baby food. For the analysis, all items are prepared in the way we normally eat them; for example, tangerines are peeled, bell peppers are gently washed under cold water, etc. They examine both imported and national produce, and one of the items they examined in their 2011 report (released in 2013) was the amount of glyphosate in soybean. The results state: "Of the 300 samples tested, 271 (90.3 percent) of samples contained glyphosate at levels ranging from 0.26 parts per million (ppm) to 18.5 ppm." The tolerance of glyphosate is set at 20 ppm, so none of the samples tested exceeded the maximum allowable levels. So we're not eating any more than we should in our food supply. However, one may argue that perhaps the "amount we should be eating" is not set correctly, which is what the papers I originally cited above will argue. That brings us to point #2. 2) In vivo and in vitro studies are vastly different. Spouse: I know you just read that and said "what??" In vitro means tissue culture or lab work. In vivo means live rats, mice, or other model organisms. So what does my statement mean? Here's an example: we use Windex every once in a while (no where near as much as we should, according to My Big Fat Greek Wedding). You probably don't think twice about it. Now, would you ever consider spraying it directly in your eye? Would you consider spraying it on an open wound, even if you water it down? If you were to design an experiment to test the toxicity of Windex, which one is more accurate: to spray Windex, use it as instructed, and measure what it does to you over a period of time? Or would you spray it on an open wound in diluted form and measure what it does over a period of time? You could argue that you should do both. However, scenario #2 is not what happens in the real world. In vitro studies (which are tissue cultures in the lab), are basically cells out in the open. It's difficult to work with them and I'm sure you heard me whine and complain about my cells "dying" when I was back in grad school. They're finicky and they die when you don't shower them with loving care. They're excellent models for many things. But I'm not sure if they're a good model for measuring toxicity, because it's like spraying something directly onto an open wound, but with the effect amplified x1000. Which is why toxicity for EVERY COMPOUND I USE IN THE LAB is measured with in vivo models (that means rats and mice). Check out the Material Safety Data Sheet for water: they tested it on rats. If we are to begin measuring the toxicity of compounds using in vitro assays, then we have to go back and do this for everything we use and eat in our daily lives. I am willing to bet a trip for two to Morocco (which is the next place on my list of places to visit... hint, hint Spouse), that the majority of the compounds we use in our daily lives will kill cells in vitro. Even the use of in vivo studies can be argued as being too rigorous. I remember that one of the post-docs that did my training would seldom wear gloves in the lab, even when working with Ethidium Bromide, which is a known carcinogen. When I asked him what the hell he was doing, he said that to replicate the rat studies which demonstrate the carcinogenic behaviour of Ethidium Bromide in humans, you'd have to take a syringe-full of the compound and inject it directly into your bloodstream. Of course, I use gloves and goggles when working with that crap because I believe that safety recommendations are put in place for a reason, but I thought that it was an interesting argument (although I don't agree with it). Which brings me to point #3. 3) No one ever said glyphosate was good for you. Dude, it's an herbicide. People have committed suicide by drinking it. As such, you have to wear protective gear and use it carefully, as outlined in the instructions for use and the Material Safety Data Sheet. Check out all the warning messages and icons on the instructions for use (yeah... they're in Spanish, but I'm testing to see if icons are universal :) ). So am I surprised that in vitro cells will die with glyphosate? Hellz to the no. But, that brings us to an important point: these studies may highlight the fact that it's important to review maximum limits of exposure for workers who work with these chemicals and that employees should be properly trained. This 2013 story from the Associated Press highlights what can happen when glyphosate is improperly used and when proper safety standards are not in place (although it's been spun by many to be about the evils of Monsanto and glyphosate). But that also brings me to my final point. 4) Is it safer than the alternative? If you believe that there's a lot of glyphosate residue in processed food and that glyphosate in our food supply will harm you, but that it's being covered up Monsanto, then the alternative is to eat certified organic foods. Keep in mind that if you believe that story, then you have to believe that this is a massive cover-up involving hundreds of scientists who want to kill you (in which case, you've uncovered the Oath of all Scientists). Then the question becomes: is it any better? A very common misconception is that organic food crops do not use pesticide/herbicide. They do. I think that the only way to make sure that absolutely no pesticide/herbicide is used is to grow your own food, but it would be incredibly naive to believe that everyone could grow their own foods. The full list of substances that are allowed under US Organic Certification is listed here. For example, if you scan through the list you'll see that hydrogen peroxide is an allowable substance for plant disease control. Here's the MSDS sheet for hydrogen peroxide. If you've ever had it applied to a wound as a disinfectant, I probably don't need to tell you that if you dilute it and put it on cells in tissue culture, they'll probably die. So, what's my conclusion? I don't think there's enough evidence that sufficient glyphosate is in our food supply to merit any alarm or that there's enough glyphosate in our food supply to be toxic to us. I think that the revision for limits of exposure of chemicals is a good idea if there's any new data suggesting that it should be re-examined. I don't think that the papers on cells dying in tissue culture are enough evidence to merit this re-examination. I think that glyphosate is a chemical that is dangerous at certain limits, but I also don't think that glyphosate should be treated any differently than any other chemical and compound that we're exposed to. I'm of the opinion that there's no global conspiracy to poison us: that scientists are out there doing their job just like you and me. As a consequence, I believe that Material Safety Data Sheets and EPA guidelines are drafted and implemented with a body of data that has been gathered after proper testing. Otherwise, I'm truly SOL given the stuff I work with in the lab all day. 3/23/2015: The International Agency for Research on Cancer recently updated their categorization for glyphosate based on existing research, suggesting that it's a possible carcinogen (group 2A classification). I have to read the papers that they reviewed to determine exactly what studies placed the compound in this category. However, it's important to note that their categorization was extremely specific: risk for non-Hodgkin lymphoma in agricultural exposure, and evidence in animal models, so it meshes with what I've already written above. I'll write up a new post after I've reviewed the papers.